I can't help but swoon over this charming, spacious kitchen. The abundance of natural light and mixed wood pieces evoked a sense of warmth, comfort and beauty! A kitchen like this will look relevant in the next 2o years or so with its classic, timeless appeal. The rustic elements will only get better in time. The conversation area with the two wingback chairs is a bonus and looks very inviting, I can easily envision it as the perfect spot for a sip of coffee in the morning or tea in the afternoon. 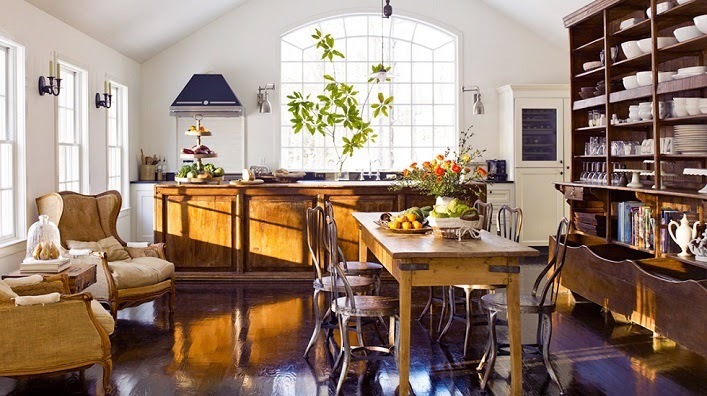 I love this refreshing and inspiring kitchen! Are you in love with the beautiful kitchen as much as I do? Wow. It feels so traditional until you realize it's a kitchen! Then it feels so modern and chic to be a kitchen. Totally love it! M.
Oh yes, love the openess in the main kitchen prep area, perfect! Absolutely phenomenal to look at ! I always wonder when I see a kitchen like this if the cook actually cooks! !